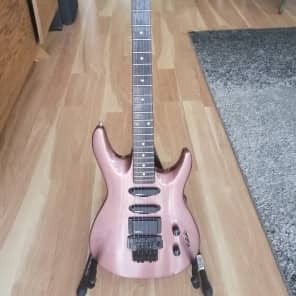 The Washburn KC70 was made from 1989 to 1991. It was a Chicago Series superstrat with an alder body, deep scalloped cutaways and angled bolt-on neck heel. The body had an arch to the top and back. The thin bolt-on maple neck had a 22 fret rosewood fingerboard with pearl dot position markers. Hardware was black including, six-on-one-side tuners, Floyd Rose 600S tremolo and locking nut. The pickups were Washburn Eliminators - one humbucker and two single coils (HSS). Controls were a single volume, single tone and three mini-switches for the pickups.Finish options were Black, Metallic Black Cherry, White Rain, Woodstone Brown, Woodstone Silver, or Woodstone Red. Take the WASHBURN KC70 price survey. Buy WASHBURN KC70 electric guitars.